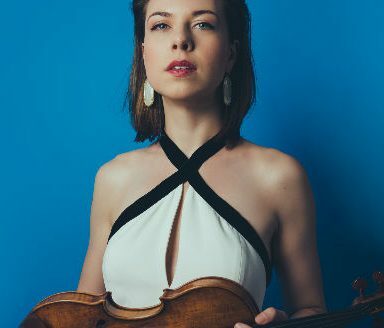 28 year old VC Artist, violinist Tessa Lark has today been announced as 1 of 5 recipients of a prestigious 2018 Borletti-Buitoni Trust Fellowship. The Borletti-Buitoni Trust, a registered United Kingdom charity, aims to assist outstanding young musicians and ensembles develop and sustain long-term international careers – providing bursaries, career advice, guidance, contacts and valuable public relations exposure. A graduate of the New England Conservatory and the Juilliard School where she studied with Miriam Fried, Lucy Chapman, Sylvia Rosenberg and Ida Kavafian, Tessa is a former major prize winner at the Indianapolis, Michael Hill and Naumburg International Violin Competitions – and a recent recipient of a prestigious Avery Fisher Career Grant and a Leonore Annenberg Fellowship. “The list of artists the Borletti-Buitoni Trust has assisted throughout the years is a formidable one … and to now be included amongst these incredible musicians is an honor I still can’t fully fathom,” Tessa has told The Violin Channel. “The help that BBTrust provides young artists in developing their careers is unparalleled … I am so excited to receive this prestigious Fellowship and to be a part of the BBT family,” she has said. 2018 Fellowships were also awarded to the UK-based Castalian String Quartet and Trio Isimsiz, Chinese violist Diyang Mei and Italian cellist Alessio Pianelli. 2018 Borletti-Buitoni Trust Awards were presented to the Dutch-based Dudok Quartet Amsterdam and Belgian clarinetist Annelien Van Wauwe. Previous recipients include VC Artists Augustin Hadelich, Alexandra Conunova, Benjamin Beilman, Itamar Zorman and the Danish and Calidore String Quartets.